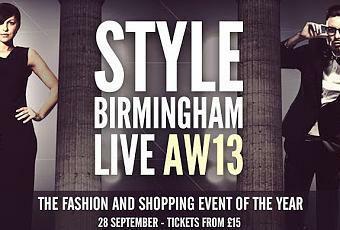 On the 28th September, all fashionistas will be flocking towards the Birmingham Town Hall to attend the Style Birmingham 2013 extravaganza. An event that has seen the handsome George Lamb, Kelly Osbourne and even Martine McCutcheon host the event. Rylan Clark and Emma Willis are taking up hosting this year. I attended the event, the year George Lamb was hosting and even got to meet the man, swoon. Needless to say I enjoyed the experience and the event. The venue of the Town Hall is convenient, as it is within walking distance of The Mailbox (where most of the discounts take place), but it also adds a sense of importance to the whole show. I favour this event over The Clothes Show, which also takes place in Birmingham. Because the location, organisation and fashion show are of a better standard and hosts are so much more likeable and professional. Getting random Z list celebrities with zero presenting experience just doesn't bode well for me. It must come as no surprise that I am looking forward to the lethal combination of the beautiful and Brummie Emma Willis and crazy and camp Rylan Clark. The event will have fashion shows, goodie bags and shopping opportunities. Perfect to grab a bargain or to have a gander at the trends for next season. So save the date of 28th September in your diary, buy the ticket and enjoy the fashion that Birmingham has to offer.